Ear/Ulcer Syringes are little sterile objects. These Ear/Ulcer Syringes are used for aspirating and irrigating pus from the external ear. Inserted effortlessly, the Ear/Ulcer Syringes help to remove the substance from the external ear canal conveniently. The GPC Ulcer Syringes are produced in 50 and 100 cc. 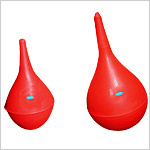 Send Your Buy Requirement For "Ear Syringe" AND Get Quote Quickly.